Chicago is slowly but surely inching closer to fall weather, and I'm more than ready. It's been a rainy and dreary past few days so I think that means it's time for soup! I'm all about comfort food in case you haven't noticed. I wouldn't say many of my recipes require many hard-to-find ingredients and there's never overly technical prep required. That's how cooking should be, right? Recently, I made a Vegan Miso Mushroom Ramen because ramen is my favorite dish and for the longest time I thought I could only get it at a restaurant - little did I know I can make it myself at home in just twenty minutes! Noodles are a staple comfort food but sometimes they could use a an extra kick. If you love some spice in your food and Pad Thai is a go to comfort food for you, try the Sesame Peanut Noodles, which have a very similar taste and probably won't require a whole trip to the grocery store. If you want something cheesy, creamy, and warming, look no further than this recipe. Cauliflower is relatively tasteless, but the best part about that means it can have flavor easily added to it. Parsnips have a slightly sweet taste to them, similar to the way artichokes do. 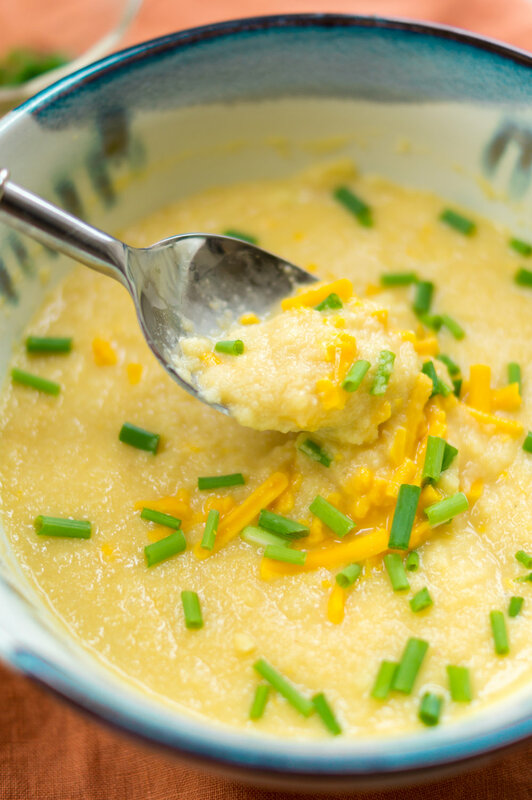 Combing the garlic, parsnips, cheddar, corn, and chives leads to a perfect balance of savory and sweet - not very common for most soups but still delicious. This recipe requires minimum technical skills and clean up, plus it makes many servings so you can meal prep this or make it for a large group of people. Makes 6 servings. Keeps for a week after making. Preheat your oven to 350 degrees Fahrenheit. While the oven heats up, smash four cloves of garlic and cut them in half. Roughly chop cauliflower and toss in three tablespoons of neutral oil and 3 teaspoons of salt. Place on a parchment or foil lined baking sheet. Randomly place 6 of the garlic halves on the baking sheet to help infuse the garlic flavor. Shave the skin off the parsnips and roughly chop into cube shapes. Toss is 1 tablespoon of oil and 1 teaspoon of salt. Place on a separate parchment or foil lined baking sheet than the cauliflower. Add the remaining 2 halves of garlic to the baking sheet. Place both baking sheets in the oven for 20 minutes. While the vegetables bake, add the No Chicken Base to 1 cup of water and stir to help dissolve. Pour mixture into a large pot on medium-high heat. Add the corn and cheddar, stirring to help defrost the corn and melt the cheese. Cover for 5 minutes before stirring again. Add a few shakes of tabasco and stir, tasting in between shakes in case you're concerned about spice. Add the chives but reserve a few pinches full for garnish at the end. Serve in bowls immediately and garnish with additional cheese and chives. Soup will stay fresh in the fridge for up to a week after making. Great for meal prepping, lunch or dinner! Have you tried this recipe? Let me know your thoughts/suggestions in the comments below!